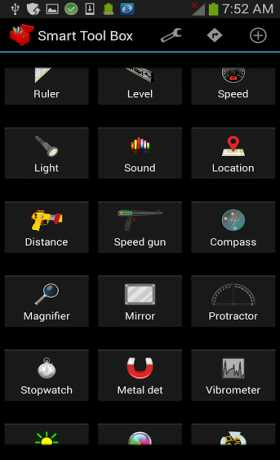 Smart Tool Box offers you the ultimate tool box app with 35 powerful smart tools in the box. It is almost a must to have it on your phone, like carrying a swiss army knife. Measure dimensions and angles of different objects. No calibration needed. 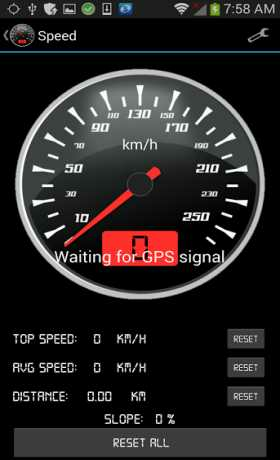 Displays you the speed on a racing-style gauge using GPS. It also records maximum speed, average speed, traveled distance and a current slope. Use it as a manual torch light, as a strobe light or as a music light show. Monitor the current sound pressure level and its spectrum. Shows your current location on the map, current GPS coordinates and the altitude. Measure distance and height of different objects using smart algorithm. Measure speed of moving objects using smart algorithm. Will help you discover the right direction. Magnify small objects that are hard to see. It also includes a flash light. See yourself using the front facing camera. 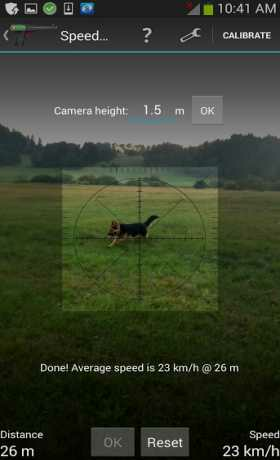 Measure the slope of any object using your camera and imaginary weight. Measure the time accurately. It also includes the countdown option. Detect magnetic field of nearby materials and observe it on real time chart. Observe real time seismograph data, based on Richter scale. The algorithm is auto-calibrating. Measure the environmental luminosity (Lux). Capture the color of any object in RGB format through your camera. Convert between different currencies and physical units. Currencies are updated automatically. Use your phone as an external mic or as a megaphone. Input/output can be switched between internal, AUX, and BT. It also includes an equalizer. Classic metronome with adjustable tempo. Tune the pitch of your voice or musical instruments. It can also play the corrected tone. Scan bar and QR codes quickly with your camera. Measure your heart rate with a camera and observe a real time pulse chart. Smart algorithms are used to filter the noise. Choose between different high-pitched sounds and volumes to call your dog. Generate random numbers from custom range. Displays current time at any location. Displays current temperature, humidity and air pressure. Measure the performance of your vehicle. You can switch between different acceleration and brake tests. It includes an auto start/stop function and a chart. See objects in dark areas, using the device’s camera. Helps you with counting objects. Tools support both unit formats (metric/imperial) and several languages. However, not all devices have the appropriate sensors to support all the tools. The app is tested mostly on Samsung, LG, HTC and Toshiba phones. Feel free to email me if you find any bugs or need any help with the tools. Please note that it is a free app with some unobtrusive ads.